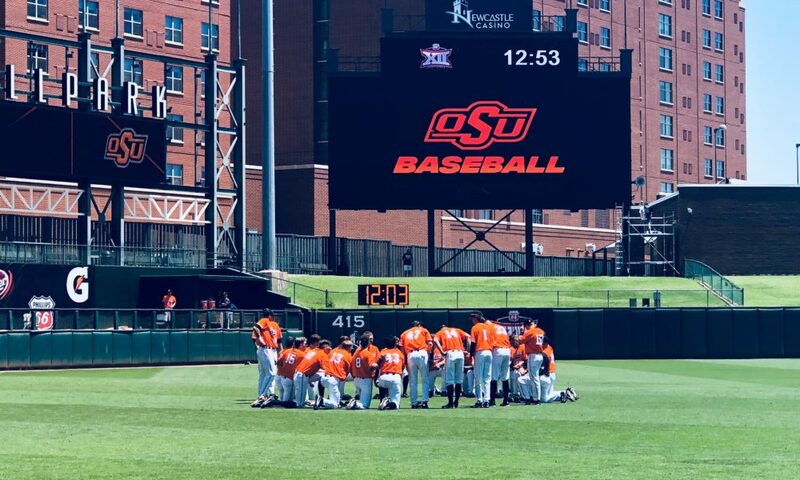 The Cinderella story that was last year wasn’t quite the case for the Oklahoma State Cowboys this time around at the Phillips 66 Big 12 Baseball Tournament. Coming in as a second seed this year, the Cowboys faced early elimination after falling to the West Virginia Mountaineers on Wednesday evening 8-5, and was eliminated after falling to the Texas Tech Red Raiders on Thursday afternoon at 6-2. LHP Carson Teel started things off for the Pokes throwing seven strikeouts but giving up three runs. Texas Tech first baseman Cameron Warren, a native to the Midwest City area, was able to blast back-to-back bombs from Teel giving the Red Raiders a 3-1 lead by the fourth inning. The Cowboys were never able to surface from the dominance of Texas Tech, and the Red Raiders walked away with a victory and an advancement in the tournament, while the Cowboys will return to Stillwater with hopes of furthering their postseason. Head coach of the Cowboys Josh Holliday was joined by four-year members Carson Teel and Jon Littell for a postgame presser. Watch here to see the reactions of Coach Holliday, Carson Teel and Jon Littell following their loss to Texas Tech.